Recent extreme floods on the Mississippi and Missouri Rivers have motivated expansion of floodplain conservation lands. Within Missouri there are more than 85,000 acres of public conservation lands in large-river floodplains. Floodplain lands are highly dynamic and challenging to manage, particularly as future climatic conditions may be highly variable. These lands have the potential to provide valuable ecosystem services like provision of habitat, nutrient processing, carbon sequestration, and flood-water storage that produce economic values in terms of recreational spending, improved water quality, and decreased flood hazards. However, floodplain managers may need tools to help them understand nonstationary conditions on conservation lands. This project worked with floodplain managers to identify the information most needed to understand nonstationary conditions, and to develop tools they can apply to conservation lands to improve decision making. Our survey revealed that time, funding, and a perceived disconnect between research and management limited the ability of managers to use new information. However, managers were willing to partner with scientists to identify science needs, relevant spatiotemporal scales, and products useful for management decisions. Floodplain managers agreed that metrics of inundation, including depth, extent, frequency, duration, and seasonality are the most useful metrics for management of floodplain conservation lands. We developed an approach to derive digital spatial layers of these metrics of inundation from numeric flood inundation models under baseline and climate change scenarios. We applied this method to the lower 500 miles of the Missouri River, making 45 spatial layers available to aid in current and future management decisions of conservation properties. Patterns of floodplain inundation vary longitudinally, with channel incision acting as the dominant control. Annually, climate change is estimated to increase the duration, frequency, depth, and extent of floodplain inundation. However, these patterns vary seasonally, with inundation increasing in the spring and decreasing in the fall. What's Next: From the collaborations made through networking from this project, the Science Support Partnership funded a project to develop similar products for the Middle Mississippi River refuge system. The project includes partners from the University of Missouri USGS Cooperative Fish/Wildlife Research Unit (Craig Paukert and Garth Lindner), the US Fish and Wildlife Service (Jason Wilson), Southern Illinois University (Jonathan Remo), and USGS Columbia Environmental Research Center (Robb Jacobson and Edward Bulliner). Our goal is to develop similar indices of inundation for the Middle Mississippi River and to explore levee realignments through hydrodynamic modeling in order to quantify the potential for refuge properties to mitigate nutrient loads. Lindner, G., K. Bouska, E. Bulliner, R. Jacobson, C, Paukert, 2018, Science to Inform Management of Floodplain Conservation Lands under Non-Stationary Conditions, Final Report to the NE CSC, February, 2018. Jacobson, R., E. Bulliner, G. Lindner, C. Paukert and K. Bouska. 2017. Managing Floodplain Expectations on the Lower Missouri River, USA. 2017 Fall Meeting, AGU, New Orleans, LA. Bulliner E., G. Lindner, K. Bouska, C. Paukert and R. Jacobson. 2017. Interactive Mapping of Inundation Metrics Using Cloud Computing for Improved Floodplain Conservation and Management. 2017 Fall Meeting, AGU, New Orleans, LA. Jacobson, R., G. Lindner, E. Bulliner, K. Bouska, and C. Paukert. 2017. Exploring Common Ground between Agriculture and Ecological Restoration in Large River Floodplains. Northeast Climate Science Center's Regional Science Meeting, Amherst, MA. Lindner, G. 2017. Floodplain inundation mapping on the lower Missouri River to support management needs. Floodplain Science Network. 11 April 2017. Lindner, G., E. Bulliner, K. Bouska, C. Paukert, and R. Jacobson. 2017. Floodplain inundation mapping on the lower Missouri River to support current and future management decisions. Missouri River Natural Resources Conference, Nebraska City, NE. Lindner, G., E. Bulliner, K. Bouska, C. Paukert, and R. Jacobson. 2017. 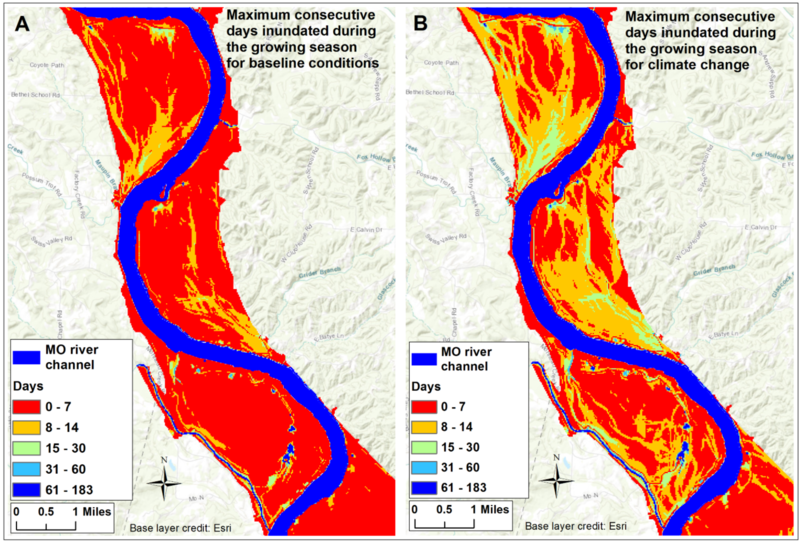 Floodplain inundation mapping under nonstationary hydro-climatic conditions on the lower Missouri River to support multi-objective management of conservation lands. Midwest Fish and Wildlife Conference, Lincoln, NE. Bouska, K. L. and G. Lindner. 2016. Science to inform management of floodplain conservation lands under non-stationary conditions. USGS Large River Initiative. 17 October 2016. Bouska, K. L. and G. Lindner. 2016. Science to inform management of floodplain conservation lands under non-stationary conditions. USGS Large River Monitoring Forum. 8 September 2016. Paukert, C. P. 2016. Climate Change Effects on Fish: What We Know and What We Can Do About It. Departmental Seminar, Iowa State University. Lindner, G. K. Bouska, C. Paukert, R. Jacobson. 2016. Floodplain inundation mapping to support multi-objective restoration and management of conservation lands on the lower Missouri River. Midwest Fish and Wildlife Conference, Grand Rapids, MI. Lindner, G., K. Bouska, R. Jacobson, and C. Paukert. 2015. Stakeholder-led Science: Engaging floodplain conservation land managers to identify and meet science needs. International Society for River Science Biennial Meeting, La Crosse, WI. Bouska, K., G. Lindner, R. Jacobson, and C. Paukert. 2015. Identifying floodplain conservation land management priorities and science needs for the Lower Missouri River. Missouri River Natural Resources Conference, Nebraska City, NE. Lindner, G.A., K.L. Bouska, C.P. Paukert, R.B. Jacobson, Science to inform management of floodplain conservation lands under non-stationary conditions, Missouri River Agency Coordination Team quarterly meeting, Mound City, MO, January, 2015. Bouska, K.L., G.A. Lindner, C.P. Paukert, R.B. Jacobson, Science to inform management of floodplain conservation lands under non-stationary conditions, US Geological Survey, Columbia Environmental Research Center, Columbia, MO, January, 2015. Bouska, K. L. and G. Lindner. 2014. Science to inform management of floodplain conservation lands under non-stationary conditions. Floodplain Science Network Conference Call. 18 November 2014. The final report fully describing the project objectives, methods, results, and conclusions. Links to two sets of inundation metrics, one for each of the baseline and climate change scenarios. Each set of inundation metrics includes 16 different raster layers. The metrics characterize total periods of inundation and consecutive periods of inundation within various seasons of interest to floodplain managers. Probability-based metrics of inundation are also included. For the full list of inundation products, see Appendix 1. We also host, for each scenario, two additional products based on flood-return interval as calculated from the model dataset. The first product is a per-pixel representation of minimum flood return interval for inundation. The second product is a series of raster grids which display water depth at each pixel for 11 flood-return intervals, from 1 to 500 years. We held a workshop in March 30-31, 2015 targeted to floodplain managers to discuss the project, and identify what management questions they have that can be answered by this project. A total of 15 people participated in the workshop form the US Fish and Wildlife Service, The Nature Conservancy, US Geological Survey, Army Corps of Engineers, Missouri Department of Conservation, the University of South Dakota, and the University of Missouri. The results of the workshop fed into the Bouska et al (2016) paper and helped us identify the metrics most important to these managers. One outcome of this workshop was that the managers were more focused on abiotic metrics (e.g., when and where will water be on the floodplain) rather than biological metrics (e.g., growth of fish, abundance of shorebirds, etc.). Although the original objective of the project was to provide biological metrics linked to floodplain conditions under nonstationary conditions, the feedback from this meeting changed our products to focus on the abiotic metrics, and the floodplain managers can use those metrics to infer biological responses of interest to their lands. News: Secretary Jewell Announces new Wildlife and Cilmate Studies at the NE CSC. December 18, 2014.